In version 3.9 of PCSWMM 2010 Standard and Professional, we have release some significant new features which are documented in other posts. However, we often do not mention the small changes that improve the aesthetics of the maps, graphs and profiles that PCSWMM produces. In this post I wanted to highlight a few of these. The latest improvement is in how we display subcatchment connectivity. The routing of runoff from a subcatchment (to a node or to another subcatchment) is now beautifully represented with a dashed line which leads to, and encircles, its outlet node. This visual representation of connectivity is de-emphasized when the subcatchment is not selected (to avoid dominating the map), and becomes more clearly marked when the subcatchment is selected (i.e. when you are specifically working with it). You have control over the color of the connectivity lines to ensure they are visible against any background, and the lines share the transparency setting of the subcatchment layer, becoming less visible as you make the subcatchment layer more transparent. 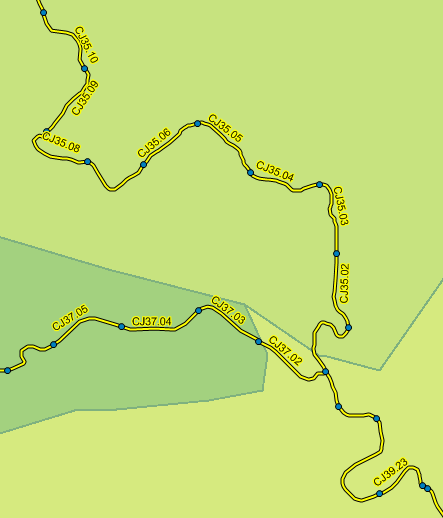 As before, the display of subcatchment connectivity in the map can be turned on or off. I also would like to highlight the incredible flexibility we have for clear map labeling. As you can see in the above image, the PCSWMM map is displaying subcatchment labels that indicate the name, area and runoff coefficient. Any number of input, results and/or user-defined attributes can be displayed simultaneously, with options to include units and/or acronyms. The labels can be enclosed in a box (as shown above) or rendered as stand-alone text in any color. They can be centered, justified, rotated or even flow along the path (as shown below) with beautiful legibility thanks to crisp anti-aliasing and placement optimization. You have full control over label font style and size, and the labels can be tied to thematic rendering. For example, you can choose to display node labels for only those nodes that flooded during the simulation (or are currently flooding during dynamic rendering of the simulation time series). The amount of information presented in the labels can increase as you zoom in and decrease or disappear altogether as you zoom out, and overlap prevention can be toggled for each layer individually. A fantastic feature of PCSWMM entity labeling is the ability to display clear and concise bar and/or pie charts directly on the plan view. Charts can be a compelling technique for displaying different attribute information than is displayed in the thematic rendering for the layer, providing multiple ways to visually convey information. In the example above, the map indicates the imperviousness of each subcatchment through a pie chart (the fraction of impervious area is shown in red). Other useful applications of label charting include subcatchment land use fractions, runoff coefficients, width factor and much more. As will all thematic rendering, legends for the charts are optionally displayed. With PCSWMM, you are not limited to viewing beautifully rendered maps in the application only. Maps can be exported to many different GIS and CAD formats, including ArcGIS, AutoCAD, MapInfo, OpenGIS, GML, Google Maps/Earth (KML), and more. In addition, complex, multi-layered maps can be exported as high resolution georeferenced raster files (with transparency), including PNG, JPG, TIF and BMP. In fact, PCSWMM can provide compelling animated renderings of both input time series and SWMM5 computed results for impressive presentations to your most important clients. In the video below, PCSWMM has dynamically rendered radar rainfall (processed by PCSWMM 2010 Professional) in a extruded "thermometer" type plot and outputted the results to a PCSWMM Google Earth presentation. Generating these types of professional visualizations is extraordinarily easy to do - the presentation below was created in PCSWMM Professional with a single button click.